With no sign of abatement in the burgeoning seven inch renaissance, Jalapeno Records are getting in on the action this summer with a number of 45 releases and re-releases. 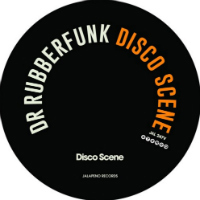 On this drop we have a cut that originally appeared on one of the earliest releases from long-term Jalapeno Records signing Dr Rubberfunk all the way back in 2001 – the Disco Scene EP. On said EP, the title track was characterised by multiple samples including drums from both The Temptations and Vernon Burch, a choice vocal snippet looped repeatedly (“Disco scene – the needle to the groove!”) which gave the track its name and made it a 12″ dancefloor sureshot. It was never out on 45 though and it was never a Jalapeno release. Which means this Disco Scene 7″ corrects not one but two historical oversights. Happy days! What to use as the flip to the original’s big-beat disco groove though? Perhaps a monster breakbeat re-flip – the ‘Breaks Of Wrath’ re-edit? Yes, that’ll do nicely. 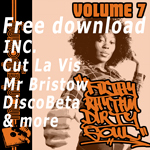 Cop it HERE via your choice of music vendor! And don’t forget to check out the summery 45s mix that Dr R has done to celebrate the event.